The theme chosen for 2008 is Time and Temporalities. Usually at the first session of the Round Table for the year we spend some time planning the meetings, both possible papers and a refreshment roster. So please consider whether you may have some research you would like to present, or other suggestions for Round Table discussions. This paper will take as its starting-point Jeffrey Cohen's discussion of "Time's Machines" in his Medieval Identity Machines. My paper will try and develop the thesis that modern medievalism has the potential to trouble the secure historical boundaries in which "the medieval" is normally confined. It will explore some of the implications of the problematic relations between what is medieval and what is medievalist in Western culture. As pre-reading, Stephanie suggests accessing Cohen’s work on his group blog, In the Middle, at http://jjcohen.blogspot.com/2006/08/times-machines_08.html. The 12th-century proto-universities were hothouses of creative theology (Abelard comes to mind), yet the schoolmen’s redefinition of orthodoxy contributed to the rise of a more centralised, and perhaps persecutory, papacy. Clare Monagle will explore this tale of tension between intellectual innovation and social control. The idea of the ‘medieval’ has often exercised a powerful hold over the imagination of late twentieth-century readers, viewers and listeners, functioning as an escape route to an exotic and sometimes transgressive fantasy world. A number of medieval music recordings have sustained the fantasy with a variety of musical strategies. Some of these strategies play with the sexual implications of vocal register and timbre. One of the most successful of these strategies has been the use of the countertenor voice with its connotations of sexual ambiguity and of a mysterious and forbidden sexual knowledge, power and enjoyment. One instance is the Boston Camarata’s Tristan and Iseult. Here the role of Tristan is given to a luscious counter-tenor, while the cuckolded King Mark is a harsh, unrefined baritone. In this paper I consider the historical evidence for the claim that ‘something akin to a countertenor voice was well-known in the Middle Ages’,* and the ways in which musicologists, performers and ensemble directors since WW2 have taken up and exploited this evidence to make of medieval music an exotic and sexually titillating otherworld. *Bowers, Roger, ‘The Performing Pitch of English 15th-Century Church Polyphony’, Early Music v. 8 no.1 (Jan. 1980), pp. 21-8, p. 22. Ptolemy's Almagest was the book on astronomy for more than 1000 years. Though originally in Greek, it penetrated Europe through Spain in Arabic versions. Gerard of Cremona, the great translator, made a version in the twelfth century. Besides its technical mathematical content, which I shall not discuss, the Melbourne manuscript contains an interesting interpolation listing the dates of kings, which list is the foundation of our own chronology. 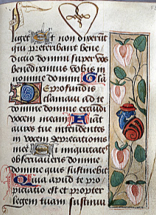 This interpolation from the Canon of Kings allowed me to date the All Souls, Oxford, Almagest manuscript and also explains notes in a common place book of Henry Savile, a Yorkshireman who became Warden of Merton College, Oxford and Headmaster of Eton - simultaneously - in the late sixteenth century. Pleasure is a concept that is simultaneously elusive and ubiquitous. It is deceptively easy to define as "a feeling of happy satisfaction and enjoyment" (OED), but this definition is immediately complicated by the second entry offered by the OED: "one's wish or desire". Is pleasure concerned with the fulfilment of the present or the desire for the future? That it can be one, or the other, or both, imbues pleasure with an often-unrecognised complexity. Pleasure is multi-layered and multi-faceted. It swirls around and through the conscious and unconscious mind, both individual and collective, directing thoughts and determining actions. All decisions are informed by the possibility of pleasure for the self; even seemingly difficult or distasteful actions are, in fact, the result of desire functioning as sacrifice, as Louise Fradenburg has so convincingly shown. Pleasure is able to operate in this all-pervasive manner because it forms part of the imaginary through which the subject engages in dialogue with the self, with the Other, and with others. This paper will consider the operation of pleasure in the late-fourteenth-century poem Sir Gawain and the Green Knight. It will explore the obscene pleasure of sacrifice and how this complicates chivalry, as well as considering briefly the pleasure of an imagined medieval nation. This analysis will rely heavily upon Fradenburg's Lacanian framework, while also employing the Bakhtinian concepts of dialogism and the chronotope. Roland Barthes has differentiated between a text of pleasure and a text of bliss (jouissance) and it will be argued that Sir Gawain and the Green Knight meets the criteria of the latter through its (blissful) rupture with medieval traditions of courtly love. Healing miracles have long been noted as being central in the construction and portrayal of medieval sanctity, making up nine-tenths of the recorded miracles in both hagiography and at shrines. In contrast to the early medieval continental norms, however, there are relatively few healing miracles in the early Irish vitae sanctorum. Previously it has been concluded that for the early Irish “it was no great problem to support the long-term sick: people were prepared to wait until the sick recovered”. This paper aims to show that not only is this intrinsically implausible, but also that it is not supported by the evidence. A closer reading of the material indicates that the people of early Ireland did in fact seek out and receive miraculous healing from their saints, but that early Irish clerical writers did not consider this particular miraculous function central when constructing a picture of the saint, their sanctity and their power. Two independent but compatible explanations will be offered as to why there is such a degree of discrepancy between continental and Irish approaches to portrayals of miraculous healing in the vitae sanctorum. That Women-kinde should vse no other Pike. To vse their tongues lesse, and their Needles more. Needlework, by its association with domesticity and the female role, lends itself to extraneous narratives, to a picture of what women ‘ought’ to be or do, which generally tells us more about the commentator than the subject. To this extent needlework may be seen, like ‘medievalism’, to describe a space in which ideas can be explored with only limited links to a conceptual framework. Modern scholarship focuses on the injunction to silence and domesticity which is reiterated by commentators through to the early twentieth century, and the subversion of that injunction by the celebration of needlework as work (significant labour for the support of the household), affection (the gift, implicit or explicit of something made personally for the receiver) and art (turning function into beauty and decorating the personal space). There is less commentary on the space in which this transformation is possible. This paper will examine the ‘space’ created by a particular form of needlework – blackwork and other monochrome embroideries – in the sixteenth and early seventeenth centuries. The fashion for blackwork at this period can be seen as a particularly apt example of the multiple meanings inherent in material objects. This embroidery could be executed with minimal materials (black or a single colour silk thread on a white linen ground) using linear or geometric patterns which were available in pattern books or adapted from illustrations of other sorts. Its applications ranged from simple edgings on linen garments to the most complex and layered of late Elizabethan and Jacobean costumes. The surviving works seldom connect into a clear context but give us a range of perspectives relating to sources of patterns and materials, variations of style and the kinds of presentation required by the possession of precious embroideries. This paper will bring together a variety of representations and the connections that they imply to sketch a space for the embroiderer’s art. Victoria Emery has a doctorate in History from the University of Melbourne. Her areas of academic interest include history of reading, women’s social movements in nineteenth century Australia and textile history. It is widely recognised in early Irish studies that the early eighth-century Vita sancti Columbae (VC) of Adomnán is structurally very different from other vitae of its time in Ireland and the British Isles. The usual structure of a ‘Life’ of a saint is one that progressively moves from ordinary babe, albeit one chosen by God for a greater purpose, to that of being the holiest of holy-adult, a saint. In this way, the earliest Lives of St. Brigit, Muirchú’s Life of St. Patrick and the anonymous Lindisfarne Life of Cuthbert are good examples. It has been speculated that Adomnán derived his structural program from Gregory’s Dialogi, a work well known in Ireland in the seventh and eighth centuries. This paper aims to make this speculation more concrete by not only reinforcing the idea that the structure of the VC was derived from Gregory’s Dialogi, but by arguing that the whole work is conceptually derived from this work on various levels. A close reading of the two texts reveals that Adomnán had a clear understanding of Gregory’s diagnostic exploration of the soul given in the Dialogi in which the ‘living’ holy man was the ‘doctor of souls’ to his flock. This exploration defines Gregory’s central thesis in his Dialogi that the holiest of paths to God pertains to a vita contemplativa. The model saint of this vita is St. Benedict and it is to Gregory’s 'Life of St. Benedict', amongst many other things in the Dialogi,that Adomnán turns to for inspiration for his VC. This paper argues for an expanded version of medieval memory that goes beyond what Jacques Le Goff calls the ‘Christianization of memory and of mnemotechnology’ that he considers to be the ‘most characteristic traits of memory in the Middle Ages’. It begins by tracing the link between memory and responsibility in the famous account by the Roman orator Cicero, in Book II of his De oratore (55 BCE), of how the Greek poet Simonides invented the art of trained memory. It then goes on to consider how poetry-as-memory discharges or fulfils an ethical responsibility by locating things in their rightful place, just as Chaucer, in writing Troilus and Criseyde, takes seriously his role as a man of letters by trying to locate Criseyde responsibly, to re-memory her – but against an interpretive tradition that reads her in very negative terms. I argue that from the beginning of the poem Chaucer puts affect, not virtue, at the centre of readers’ responses. The scholastic injunction to channel things through desire, to ‘remember what right action feels like’, is here directed towards not the abstract contemplation of ‘“our own ugliness, … our own beauty”’, as Gregory the Great, quoting Augustine, envisaged the ethical import of reading the Bible, but towards the recognition of a shared past history between Troilus and the readers of Chaucer’s poem. To make this claim is historically innovative ­ one of the many innovative things about Chaucer’s poem. The last part of the paper offers a rereading of the narrator’s passionate desire to intervene in the cultural memory of Criseyde. Ruth Evans is Professor of English at the University of Stirling. She has written and published widely on medieval English literature, critical theory and sexuality, with a special interest in Chaucer, medieval drama, medieval virginity, literature and technology and cultural memory. She is co-editor of a number of essay collections: Feminist Readings in Middle English Literature: The Wife of Bath and all her Sect, Medieval Cultural Studies: Essays in Honour of Stephen Knight, The Medieval Translator and Medieval Virginities. After the meeting everyone is invited to join us for Christmas dinner at Il Vicolo, 50 Grattan Street in Carlton (http://www.ilvicolo.com.au/). We have arranged for a set price menu, with choices. Gluten-free and vegetarian options will be catered for by request on the evening. The cost will be $40 per person; drinks are extra and we can take our own wine. If you would like to come then please email Andrew Stephenson (andrewws@unimelb.edu.au) so that numbers can be confirmed by Friday 28 November. (Once we do confirm numbers then we are committed to pay for the number booked for, regardless of late cancellations.) Our last dinner at Il Vicolo was most enjoyable, so it will be nice to see as many of you as possible this time.